Home Opinion Guest Editorials We need a national discussion: Are you a racist? Today in America, local, state and national news programs report on racial unrest nearly every evening. The word “racist” tempests across this country like a tribal Hurricane Katrina. In the past month, U.S. Senator Charles Schumer called the president of the United States a ‘racist’. House member Nancy Pelosi welcomes those who violated U.S. borders as “new Americans” while anyone who disagrees with her becomes a racist. This month, NBA great Lebron James accused President Trump of being a racist. Television host Laura Ingraham responded, “Shut up and dribble!” James responded by calling her a racist. During the Olympics, speed skater Shani Davis proclaimed the coin toss as racist because he didn’t win to carry the American flag at the opening ceremonies. Major newspapers condemned the games as not representing “the true America” because of the nearly 100 percent white athletes. Louis Farrakhan, Al Sharpton and Jesse Jackson accuse all whites of being racists. One black lady on Facebook gave a lecture as to why all whites prove themselves racists by the color of their skin. As to ethnic differences, consider the racism of these groups: Black Lives Matter marching against whites; La Rasa (Which means the race and nothing but the Latino race), working on Reconquista of the four border states; Moslem Brotherhood working to install Sharia Law across America (the most racist religion on Earth with its prime directive stated in the Quran: “Convert or kill all non-believers.”); Antifa for a violent end of the U.S. Government; and dozens more. The questions beg to be asked. What constitutes racism? Who turns out to be a racist? Another source stated that racism and racists create systems to degrade members of particular racial groups. The general consensus of blacks in America remains: white people cause racism. Therefore, the question might be pursued: what causes racism among human beings? A look back at humanity’s survival provides the answer: ethnic tribes protected their own. They fought against other tribes. Evolution brought about differing characteristics of humans based on where they lived. In reality, racism stems from biology. In other words, it exists in the fibers of every ethnic group. No matter how much education, how much empathy and how much abundance—members of ethnic groups prefer to be among their own. While able to mingle across America, they self-segregate at every dining table, sporting event and church. In Japan, no racism exists. Why? They remain a homogenous group. If you, as an American, lived in Japan, you would never become Japanese. Same with China, Iraq, Pakistan, Mexico and just about every country in the world. Racism exists where ethnic groups mix. Today, because of America’s success as a civilization, every desperate human being in third world countries yearns to emigrate to America. By its own hand, this country lunges toward a disastrous precipice of multi-cultural, multi-racial, multi-ethnic, multi-linguistic and multi-religious chaos. Everything being forced upon Americans by the U.S. Congress counters all the realities of Nature. In every country where races mix, you see conflict in one form or another. Burma, Iraq, Canada, Australia, France, UK, Norway, Sweden, Holland, Belgium, Germany, Italy, Spain, etc. As an example, what happened to Detroit, Michigan? At one time, virtually an all-white city with 1.85 million residents. During WWII, blacks arrived to work in the factories. Through the 80s and 90s, schools became war zones with minority intimidation. A horrendous 78 percent high school dropout rate as reported by Brian Williams of NBC at the time. Stores suffered massive shoplifting and employee theft. Minorities burned cars, spray painted everything, stole everything, carjacked people at stoplights and threw trash everywhere. Over one million whites fled. Today, Detroit hovers around 650,000 people, mostly black and now Arabic immigrants—virtually all on welfare. Since no amount of freedom, wealth, education or jobs seems to stem racism, what can America do to save itself from its fragmenting racial divide? The question knocked me back on my heels. First of all, he wouldn’t have asked the question unless he assumed my guilt in the first place. Second, what would the second question prove being a non-sequitur? As a world traveler, I respect all races, colors and ethnic groups. Every person on the planet does the best he or she can do to make it through this life in good stead. I told the person I didn’t appreciate the guilt-ridden question. I stood my ground. Racism abounds in every human interaction where humans mix races. The Romans used slaves and on down the line. Slavery exists in Africa today and many other parts of the world. If you look at American corporations paying third world people $1.00 a day to sew Niki tennis shoes, you’re witnessing 21st century racism. When you watch Marriott Hotels using illegal migrant chamber maids at sub minimum wage, you see racism. So, how do we solve racism and racists in America on both sides of the racial divide to bring about a more wholesome and peaceful society? We better choose to respect each other, tolerate each other and co-exist with one another. You as a black person may not want to be around white people, and you as a white person may not care to associate with black people. Or, you might enjoy certain people of different races. It’s a personal call. However, you can choose to respect for each human being you encounter. We need Oprah and all black leaders to speak about peaceful co-existence as well as top white leaders speaking and practicing the same. Yes, we may choose to live in separate neighborhoods, yet, we must learn to work peacefully and co-exist with one another in general society. If not, American society and culture face that rocky precipice where few flourish. Frosty Wooldridge is a Population-Immigration-Environmental specialist: speaker at colleges, civic clubs, high schools and conferences. 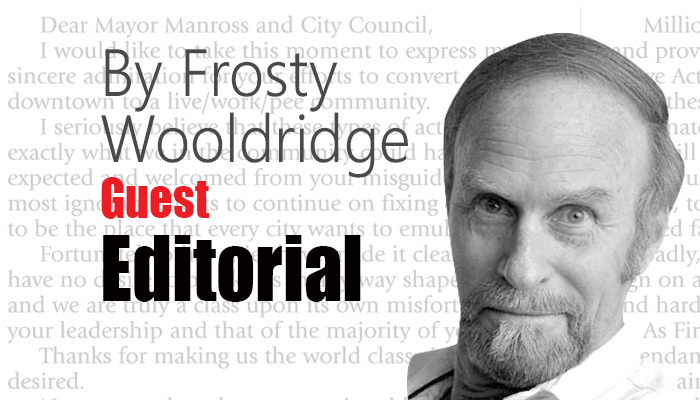 Facebook: Frosty Wooldridge. Facebook Adventure Page: How to Live a Life of Adventure: The Art of Exploring the World.